List V: List of Ship Stations and Maritime Mobile Service Identity Assignments. 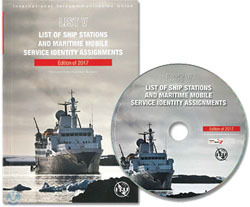 The List of Ship Stations and Maritime Mobile Service Identity Assignments (List V) is a service publication prepared and issued, once a year, by the International Telecommunication Union (ITU), in accordance with provision no. 20.8 of the Radio Regulations (RR). As stipulated in Appendix 16 to the RR, this List shall be provided to all ship stations for which a Global Maritime Distress and Safety System (GMDSS) installation is required by international agreement. The List is published in CD-ROM format and contains the Preface and Reference tables in a booklet form. The CD-ROM contains information concerning Ship stations, Coast stations and Search and Rescue (SAR) aircraft for which an MMSI has been notified to the Radiocommunication Bureau as well as other ship stations, predetermined groups of ship stations, Accounting Authority Identification Codes (AAICs) and contact information of notifying administrators. The CD-ROM also includes a database, which enables users to search for and display, particulars and details of ship stations, Accounting Authorities and countries responsible for the notifications.